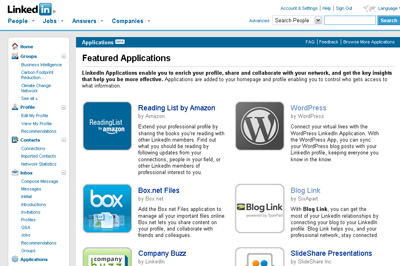 LinkedIn has finally launched its applications area, clearly this has been in germination for some time. Last time I looked the apps platform was a closed beta – will have to check and see if thats changed. I came across Alfresco a couple of years ago at the MySQL European Customer conference – at the time they were relatively new and didn’t look that relevant. I’ve kept one eye on them since and have recently had the opportunity at work to look at alternatives to Sharepoint. Alfresco is now looking very, very interesting in this respect. Its not that often (although admitedly it is now getting more common) you find an Open Source product that is strong on features / usability and is technically strong. The reason I say it is technical strong is due to the way it embraces and leverages Open Standards and Open Source Java components (Such as Hibernate etc – which good PHP frameworks have borrowed heavily from recently). Another Interesting Alfresco blogger is John Newton: http://newton.typepad.com/content/ He has an article on CMIS (Content Management Interoperability Services) which sounds fantastic. Talking Green IT strategy at the Green IT Expo! Work asked me to talk at the Green IT expo Tues/Wed this week at the Barbican in London – so I put together a talk on how we see IT being used strategically to address Environmental management and other business critical issues (eg cost minimisation). I talked about how Green IT should be more than just trying to reduce IT’s energy/environmental footprint (through initiatives such as virtualisation) – but also how IT can capture critical business data (eg on Energy use, and employee behaviour) and also how it can help with the digitisation of products and processes (reducing energy/waste – eg through elimating paper production). My first proper public speaking gig so a bit scary; but I’d love to do more of it! Photo is one of my colleagues managed to grab during my talk on Tues – I am holding one of our brochures. The Green IT expo was an interesting event – IBM had a big presence and the general focus was mainly on the data centre and IT end of life equipment waste. Adobe did an interesting talk on focusing on the usability of online processes (eg those replacing paper) dovetailing quite nicely with some of my content. Learn’t more about their LiveCycle suite – http://www.adobe.com/products/livecycle/ which looks really interesting for creating paperless processes although it isn’t cheap unfortunately!